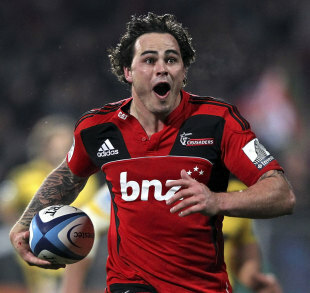 Zac Guildford will return to Super Rugby from the bench when the Crusaders host the Southern Kings at AMI Stadium on Saturday. The All Blacks winger, 24, makes a delayed start to the season after alcohol-related problems prompted him to take a self-imposed break from all rugby in January. Guildford's inclusion is one of four changes coach Todd Blackadder made to the side that thrashed the Bulls 41-19. Willi Heinz takes over the half-back role from Andy Ellis while Luke Romano returns from injury, moving the impressive Dominic Bird to the bench. On that bench, debutant Codie Taylor will have the opportunity to earn his first cap after Ben Funnell was suspended for a dangerous tackle in his side's 41-19 Super Rugby win over the Bulls in Christchurch. Guildford's return is a timely boost for a Crusaders side that had become dangerously short of strike weapons out wide before Johnny McNicholl returned from injury last week. The IRB Rugby World Cup-winning All Blacks star was cleared by the New Zealand Rugby Union to return to rugby two weeks ago, since when he played two club games for Napier Tech to build fitness. Crusaders: Israel Dagg; Tom Marshall, Robbie Fruean, Ryan Crotty, Johnny McNicholl; Dan Carter, Willi Heinz; Kieran Read (captain), Matt Todd, George Whitelock; Samuel Whitelock, Luke Romano; Owen Franks , Corey Flynn, Wyatt Crockett. Replacements: Codie Taylor, Joe Moody, Dominic Bird, Luke Whitelock, Andy Ellis, Tyler Bleyendaal, Zac Guildford.